If you are looking for a bank loan or SBA loan for your restaurant concept, the bank is probably going to ask you to provide financial projections for your company. If this is a startup restaurant and you don’t have historic financial results to base your projections on this can be a daunting task! At ProjectionHub, thousands of business owners have used our app to create their own financial projections, but what we have found is that thousands more are overwhelmed at the thought of creating their own projections without some help. 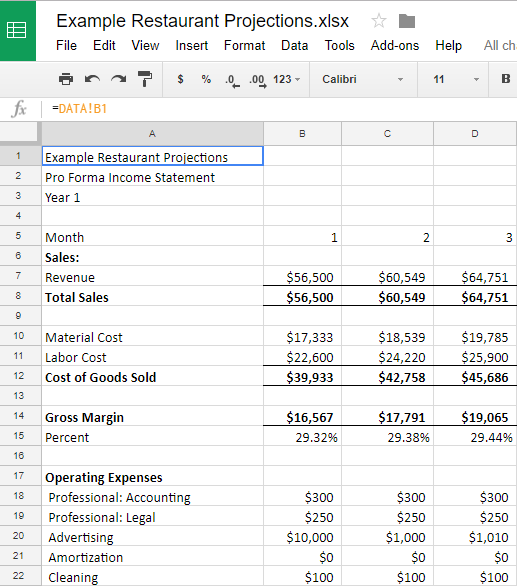 So we have started to provide some basic consulting to help clients create a custom financial projection model for their restaurant. Here is an example of one of our recent projects, so that you can get an idea of what the finished product looks like. You have an understanding of your finances, not just food. Your projections are realistic – they might look at some financial ratios and compare to industry averages like these. Do your projections show sufficient cash flow to repay the loan. If you would like some help developing a financial model for your restaurant that will meet the standards that the bank expects to see, tell us more about your project here.